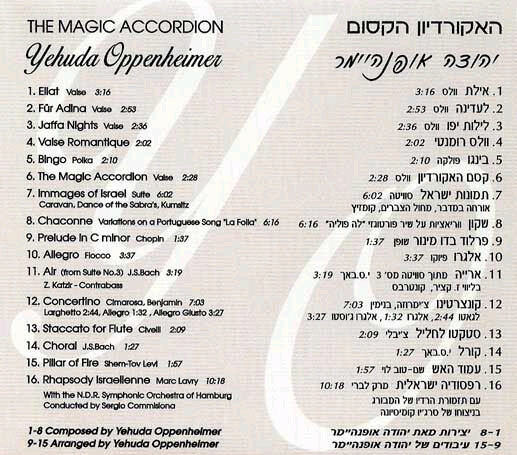 The pioneer and ensign of the accordion in Israel, Yehuda Oppenheimer has released a CD of many facets, that is divided in four parts. The first part is reserved for different waltzes that the editor of the recording notes (Adina Yanai) defines as " musette". Some of these waltzes are very beautiful, more for "concert" (than for "dance") not traditional "musette", nor any less compared to today's style of hyper-virtuosistico. The Waltzes of Oppenheimer are nearly always veiled by some melancholy. Maybe traces of touching events that happened in his youth: his birth in the Nazi time of Germany, having survived the exterminations being hidden by a Dutch family, then moving to Israel after the second world war. 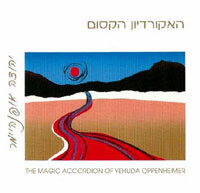 The second section is constituted by two good original compositions of Yehuda Oppenheimer for Standard Bass Accordion: the "Images of Israel and the Chaconne". For certain the Chaconne of "La Folia" is the piece that has made him known worldwide amongst accordions as a composer, a true concert passage also much appreciated by the public (unfortunately not written for free-bass instruments). 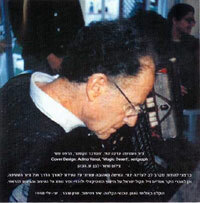 I think, that the three "Images of Israel" are very characteristic pieces indeed, with melodies, harmonies, rhythms and exclusive love indeed of the land of Israel; a piece that I am personally very much affected by, as I have had the possibility to study and perform (this work is also published in Italy). The third part is a bit more problematic: a sequence of transcription for standard bass accordion that is not easy defendible and sustainable from the critical point of view and as musicologist - but the great limitation of the standard bass instruments are in comparison to a repertoire of Johann Sebastian Bach, Domenico Cimarosa, Joseph Hector Bow and Fryderyk Chopin historically accepted. The last passage is the true pearl of this CD. Oppenheimer evidences himself as perfect performer (as in Chaconne) and proposes a composition that would deserve further diffusion for all levels. I am talking about the "Rhapsody Israelienne" of the Israelian composer of Latvian origin, Marc Lavry (1903-1967). This is a very good piece written for accordion and symphonic orchestra. Yehuda Oppenheimer presents this piece in collaboration with the Radio Symphony Orchestra of Hamburg under the direction of Sergio Commissiona. One can denote very clearly, the dowries of Lavry for composing orchestral works full of colors, timbricamente, rhythmically very rich, indicating without problems, the role of free reed instruments and a whole orchestra. This composer in fact has a particular appreciation for free reed instruments: and in his catalogue of works, its noted the work "Concertino" for mouth harmonica and symphonic orchestra.